Electrophoretic techniques separate charged molecules in an electric field. The mobility of a molecule is inversely proportional to its size and directly proportional to its charge. During electrophoresis, proteins move towards an oppositely charged electrode in an electric field. The rate of their movement in an electrophoretic system is governed by several factors such as temperature, pH, and buffer concentration in addition to intrinsic properties such as the size, charge and shape of the proteins. Electrophoretic separation of proteins strictly on the basis of their molecular weight is possible only if the charge of all the protein molecules can be manipulated to the same sign. 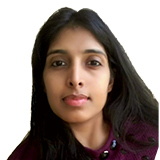 In such a case, the mobility of the protein molecules will be solely reliant on their size. Polyacrylamide gel electrophoresis (PAGE) is a technique based on this idea and is used to separate proteins on the basis of their size. In PAGE, an anionic detergent called sodium dodecyl sulfate (SDS) is used to bind to proteins and give them a negative charge. Proteins are then separated electrophoretically according to their size using a gel matrix made of polyacrylamide in an electric field. Polyacrylamide is produced as a result of the polymerization reaction between acrylamide and N,N'-methylene-bis-acrylamide (BIS) using a catalyst. The degree of polymerization or cross-linking can be controlled by adjusting the concentration of acrylamide and BIS. The more the cross-linking the harder the gel. Hardness of the gel, in turn, modulates the friction experienced by macromolecules when they travel through the gel during PAGE, thus affecting the resolution of separation. Loose gels (4-8% acrylamide) allow higher molecular weight molecules to migrate faster through the gel while hard gels (12-20% acrylamide) restrict the migration of large molecules and selectively allow small ones to move through the gel. Protein samples are denatured by heating them with a detergent SDS and mercaptoethanol. The former binds strongly to the proteins and gives them a high negative charge whilst the latter frees sulfhydryl groups, thus yielding polypeptide chains carrying an excess negative charge and similar charge to mass ratio. This helps the resolution of proteins strictly based on their size during gel electrophoresis. The electrophoretic gel usually has several components including acrylamide, BIS, and a buffer. The mixture is degassed to prevent bubble formation during polymerization of the gel. Ammonium persulfate, a free radical source, and a stabilizer are added to start polymerization. BIS is also added to form cross-links between acrylamide molecules until a gel is ultimately formed. As an electric current is applied proteins migrate through the gel to the positive electrode as they have a negative charge. Each molecule moves at a different rate based on its molecular weight - small molecules move more rapidly through the gel than larger ones. Migration is usually faster at higher voltages. After a few hours, the protein molecules are all separated by size. 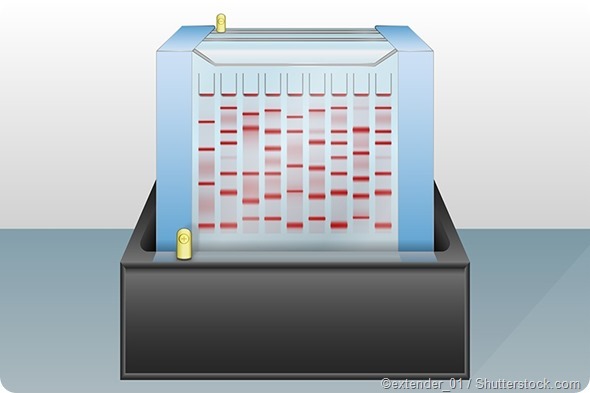 Once electrophoresis is complete, the gel can be stained using colored dyes such as Coomassie Brilliant Blue or ethidium bromide to make the separated proteins appear as distinct colored bands on the gel. Unbound dye is washed out from the gel. The stained gels are then dried so the color intensity of the protein bands can be measured. Bands of radioactive proteins can be detected by autoradiography. The proteins can also be quantified as the protein content is directly proportional to the quantity of the bound dye. 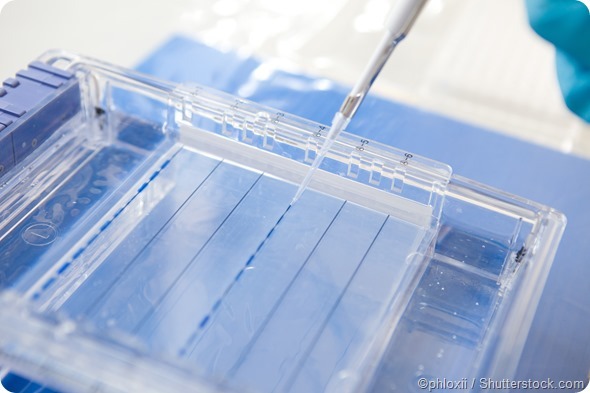 Some gel systems introduce a tracking dye such as bromophenol blue along with the protein sample – the visible distance travelled by the dye on the gel helps in deciding the required duration of electrophoresis. Bromophenol blue travels along with the sample molecules until it eventually reaches the bottom of the gel. Electrophoresis needs to stop at this point to ensure no protein molecules electrophorese out of the gel and into the buffer.